I’ve started trying to get back into the habit of doing a small amount of painting each evening, in order to re-train some of the muscle memory I’ve lost over the last few years. First up from Shadespire are a couple of Garrek’s Bloodreaver warband: Garrek himself, and his henchman Arnulf. 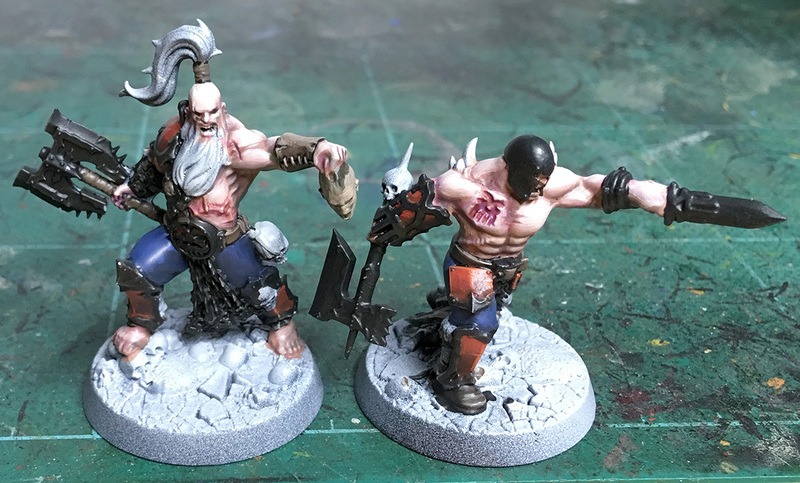 I’m very rusty, but I’ve enjoyed working on the skin tones for these two: shading with purples, reds and greens, and building up to a bright yellowish-white for the highlights. There are lots of interesting textures to work with, particularly on the torsos. Unfortunately, I tried spray undercoating on a very windy day, and have ended up with a very thick coat of paint – particularly over the faces of this warband. I think I can salvage them, but it’s going to make things much harder when it comes to detailing the faces. Flesh, leather and red armour panels are pretty much done on these two – I’d been considering some non-metallic metals, but it’s been ages since I did much work with regular metallics. My silver paints have mostly dried out, so I’ll start work on the blades and buckles once I pick up some new ones.